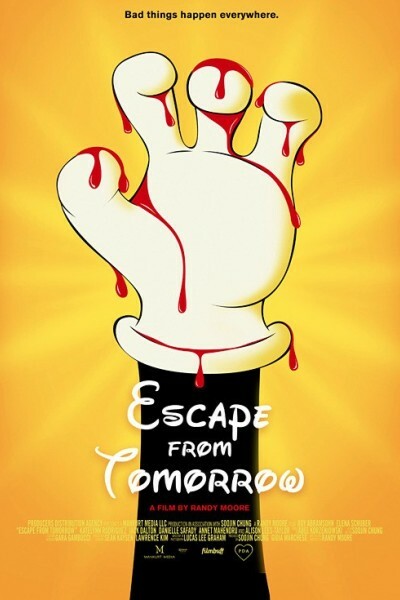 Even before its release, Escape from Tomorrow gained notoriety for setting its perturbing story at Disney World and shooting on location, prompting bloggers from the four corners of the Web to conjecture about potential copyright issues. For the record, the Walt Disney Company has no more claim of ownership over this movie as it would over your uncle’s camcorder footage of his last family vacation. Writer-director Randy Moore could, on the other hand, get sued for filming without a permit, but the emperor mouse has stayed surprisingly quiet on the matter, presumably to avoid bad publicity. Then again, part of me wants to believe Mickey would find himself receptive to Escape from Tomorrow and what the film’s got to say about the self-proclaimed “happiest place on earth”. You see, for all the press his stunt garnered, Moore targeted Disney World in service of a genuine artistic statement. His thesis touches on the core of a generation raised to believe that it’s not just capable but entitled to achieve its every dream: “happily ever after” is the stuff of children’s fairy tales, not a sustainable lifestyle. Consider the anti-hero of Escape from Tomorrow, portrayed by Roy Abramsohn as a bumbling everyman with guileless but fundamentally self-absorbed ambitions. After losing his job in the middle of a family vacation, Jim just wants to spend the day in blissful denial, neglecting his children and wasting what little cash he’s got left on Disney memorabilia. However, his forced smile soon takes its toll as the Magic Kingdom and Epcot Center assault him with nightmarish visions of animatronic demons and black-eyed pedestrians. The whole ordeal is shot in black and white so as to better integrate the handful of green screen sequences. We also get a fair serving of computer generated imagery, such as when a technician literally loses his head or the giant Spaceship Earth sphere explodes. Flawlessly executed, these shocking scenes comprise the basic hook of Escape from Tomorrow, which makes it all the more puzzling that Moore keeps them so few and far in between. As a result, the pacing can prove challenging at times if not downright sluggish, like that of an overambitious student film project. 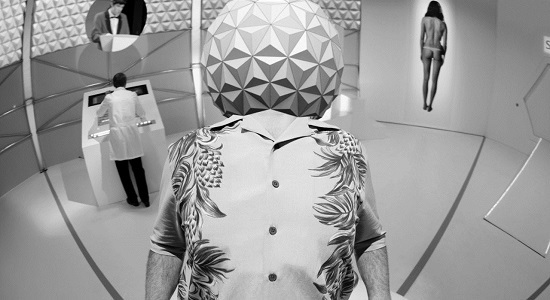 The meat of Escape from Tomorrow focuses instead on Jim’s interpersonal relationships or rather his desperate refusal to live up to their responsibilities. He keeps losing his daughter, Sara (Katelynn Rodriguez), and drags her older sibling across the entire park to gawk at two French teenagers, Sophie (Danielle Safady) and Isabelle (Annet Mahendru). His obsession isn’t sexual, we understand, but a pathetic longing for more innocent days, one that his son, Elliot (Jack Dalton), deeply resents, perhaps instinctively aware that the “world of tomorrow” belongs to him, not his father. Our protagonist’s wife, Emily, suffers from a similar form of denial, going so far as to reject any romantic attention in order to project the image of a wholesome, Disney-approved family. When she finally learns the truth about her husband’s unemployment, she offers little support or understanding, blaming him instead for shattering the dream of a perfect suburban existence. Actress Elena Schuber does a terrific job keeping her character believable and yet utterly unbearable so that we almost forgive Jim when he ends up sleeping with a former Disney princess. I mean the kind to hug children at the Magic Kingdom gate, not the twerking kind. As per Disney iconography, this other woman (Alison Lees-Taylor) became a witch when she grew old, transitioning from plucky princess to evil queen. As disturbing as the notion may seem, it’s what we’ve been teaching our kids for nearly a century: that virtue lies in staying young at heart and dreaming forever because, you know, nothing spoils the human soul more than embracing reality and the challenges that come with adult life. According to Moore, “happily ever after” doesn’t just make for a lie but a deadly cultural disease, one that informs the end of Escape from Tomorrow and turns it into a devastating slap in the face.